I've got yourfree printable calendarfor September as well as another fabulous coordinating freebie from School Rules. There are going to be a lot more new releases on the first that I'll have to show off next week and I'll have a new challenge up in our scrap-a-licious group on FB. You get 10 design papers, 7 textured solid papers and 35 different elements or embellishments in this download. It's just $3.99 in our shop at Etsy. Here are a few pages from my team. I still have to play! On Monday, we'll have some of our templates from Etsy at our shop at Scrappy Sisters. You'll be able to get all three of these packs of templates for 50% MONDAY ONLY. I'm showing off one page from each pack that I designed. I used goodies from LouCee Creations, Aimee Harrison Designs as well as our very own, Amethyst Allegory. Here is our latest freebie along with just a few others from around DigiLand. Did you see our gorgeous collection from last week?! So many fabulous papers and embellishments and even a pack of super templates designed by yours truly. Grab it while you can. We'll be splitting these up soon. 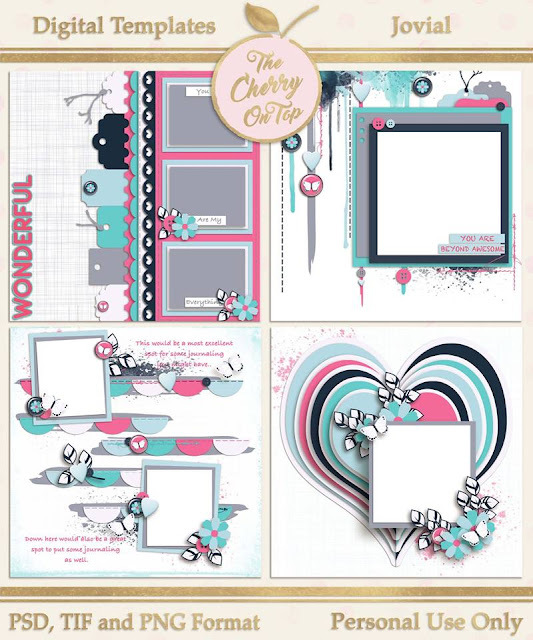 The Digital Scrapbooking Studio has several freebies in their newsletter and around the site. You can find them on their blog and in the forum. Go see what's free and new over there. My gal Dagi, is giving away all of these beautiful templates to her newsletter subscribers. Maybe something the way I did this summer? Sign up and don't forget her group on FB where she'll be sharing all kinds of super scrappy stuff. Summer is winding down and the heat wave is finally over, here in Europe. Now, it's even a bit chilly and we're fortunate enough to have gotten a few drops of rain the past few mornings. I've got your next reason, "You don't care what others think." It is not the one in the preview. Hehehe...If you are needing Reasons 1-28 go tolast weeks blogfor the link and you'll get a link for the blank cards, too. I wanted to show off a hybrid project I'm finishing up. I'm using a super scrappy collectionfrom myself, Made By Keuntje and Throwing Some Scraps Around. I've provided a pack of 4 digital templates with these nifty folded style shadows down the center so it really looks like a book. Of course, when I print, fold and bind them FOR REAL, I won't need them. Hehehe...I want to design a few inserts for in the book yet and I want to do a couple more pages from my fabulous trip to Bernkasteel in Germany. I'll be sure to show off the finished project! I've got Reason 25 ready for you. I'd love to know how your albums are coming along. Pop over to ourgroupon FB and show us your progress. Reason #25 is, "I love that you love being you." Both my boys have Autism and they are totally ok with it. They can act very...strange at times and we're mostly great at just letting it go and letting them be them. I'm so, so happy my boys are comfortable in their skin and don't let people's glaring bother them. Click here to get Reasons 1-27 and the blank cards. If you area all about printables, I just put these pretty planner printables in my Etsy shop, Kreative Design Studio. The smallest bits are 1.5 inches so they'll fit in most planners. If you want to find out how to get THE best printing results, check our blog on just how to do that, here. I thought I'd show off an alternative way o using your planner printables and dash boards. I used mine to scrap a very simple page. Consider an 8x8, 6x6, 4x4 in album or even use the journal cards for your Project Life pages. Above you'll find the new, free printable calendar for August. How are you binding your calendar pages so far? Let me show you a calendar I designed a few years ago and how I bound it. It is so, so simple! Thank you for spending time with The Cherry. I'm always so, so excited to bring you all of these new goodies each week. This week I'm even more excited and I didn't think that was possible. Hehehe...Despite the fact that our Volks Wagon has broken down for the second time in weeks costing us several thousands of dollars and leaving us stranded in a foreign country with visiting family from America, I'm still delighted to bring you this scrap-a-licious travel collection from The Cherry, Throwing Some Scraps Around and Made By Keuntje. I like keeping a travel journal and wanted to design these special templates that are notebook, travel journal AND traditional 12x12 sized. The traditional sized are in the shop at Scrappy Sisters. If you are in need of the other sizes contact me. It is possible to change the size of a template with a bit of computer savvy. There are so many pages, but I'll just show you a few. I would encourage you to visit the Scrappy Sisters galleryand see more beautiful pages over there. I suppose these could be even a bit project life style, too. Now, check this out. I added a "folded" layer style from Mommyish, to get that book effect. What works in PSE, is to clip in the paper of your choice over that folded layer and copy the layer style of that original, and paste the layer style onto your chosen paper. This first page doesn't have the effect, but the four after do. Those are my pages. I'm going to print my pages, then fold them and make an actual hybrid travel album. I don't have a printer where I'm at, but I'll certainly be showing off the results once I've got the journal all finished. Check out Jodi, from Throwing Some Scraps Around page. She also has some new templates in the shop and they are mega cool. Check out From Another Angle. This is the freebie from the newsletter for Scrappy Sisters. Make sure you are signed up so you don't miss out on all of our new products, social happenings and freebies. I used a map and some lovely coordinating, textured card stock to design these. I wanted to show off a couple of really, really fabulous pages and new products from our Scrappy Sisters shop. The shop is growing so fast. The gallery is getting nice and full and our scrap-a-licious group is certainly an inspiration spot, too. Join us! We'd love to have you. The products are linked up by the images so you just have to click on the image to get to the goodies. I found this nice freebie on Patty B scraps FB page. The Studio has a lot of challenges with freebie, every month. This one is pretty sweet! My gal Rachelle has some more fabulous free templates for you in her group. Go grab them while ya can! This site is full of free stuff! Every Friday we post freebies. Here are a few of our most recent ones.